Famously known for her sculptural compositions of thread and string, Sue Fuller (American 1914-2006) was first successful in the realm of printmaking. Her print work in the 1940s and 1950s show a strong use of textiles to communicate texture and bring her abstract images to life. Fuller was born in Pennsylvania, the daughter of a bridge engineer, who often built models out of thread and glass. Fuller had the opportunity to study with Joseph Albers and eventually enrolled at The New School for Social Research to study printmaking. It was here that Fuller joined the Atelier 17: an abstract print making collective comprised of 60 women at The New School. This collective was committed to exposing the art world to abstract printmaking and furthering the careers of female artists and designers. The Hen is recognizable in its form, yet, presents itself differently than would be expected. It is perhaps a precursor to Fuller’s later sculptural work and suggests that what starts on paper often realizes itself later in three dimensions. To achieve the detailed look of the hen, Fuller pressed a lace collar into the ground of the etching before engraving details. This is what gives the shape of the hen its dense geometric form. Traditionally a textile produced by women, lace has nuances of delicacy, femininity, and gentility. The way that Fuller uses the lace to create the severe shapes transforms our understanding of what lace can do. It loses its softness in exchange for a bolder finish. From there Fuller adds shard like shapes coming off of the hen’s body, head, and tail which make the hen look razor-edged and almost violent. Like lace, hens are also signifiers of female domesticity and security, invoked to create a sense of “coming home” to the fetishized, quaint farm. Fuller’s hen is prickly and unapproachable, hardly warm and comforting. The sharpness of the angles make the hen vibrate with an electric energy; the outlying lines seem to pulsate, giving the hen a sense of urgency. As viewers, we catch the beast in a vocal moment; the energy of the lines communicates the sound we might hear if it were before us. The technique of using lace to make a traditionally docile creature violent suggests that we might see women in a new light as well. The women of the Atelier 17 longed for visibility in the post-war art world as they sold and exhibited prints that were on the forefront of art and design. It was hard for female artists to establish agency in a male dominated world and their work may have reflected this struggle against traditional ideals of feminism and equality. 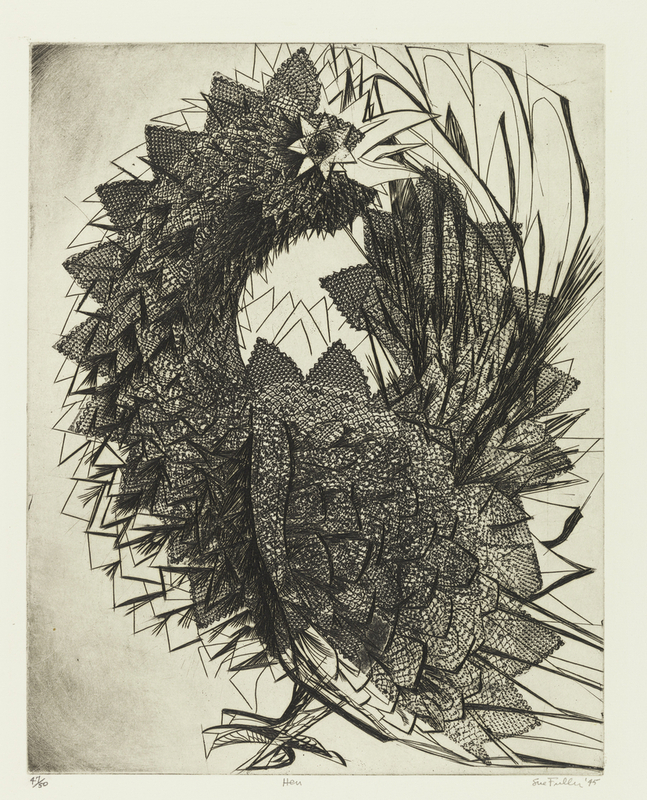 Fuller’s hen represents so much more than an abstracted form; it speaks to the frenetic spirit of the place that women artists wanted to make for themselves in post-war America. Amanda Kogle is a candidate in the MA History of Design and Curatorial Studies program offered at Parsons The New School of Design jointly with Cooper Hewitt, Smithsonian Design Museum. She is a Master’s fellow in the Drawings, Prints and Graphic Design department. Anne Lee Morgan, The Oxford Dictionary of American Art and Artists, (Oxford: Oxford University Press, 2007), 172. Christina Weyl, “Networks of Abstractions: Postwar Printmaking and Women Artists of Atelier 17,” Smithsonian Archives of American Art, October 3, 2016. http://www.aaa.si.edu/essay/christina-weyl.